There are a few Cumberland Rivers in the world, but this site is specifically about the one found in the Southern United States running from the Appalachian Mountains to join up with the Ohio River. It comes in at 688 miles long and flows through both Kentucky and Tennessee and features the Cumberland Falls, which is one of the biggest waterfalls in the southeast United States. You can also see a rare moonbow at the falls. The biggest city you will find along the banks of the Cumberland River is Nashville in Tennessee. Originally called Wasioto and later Riveriere de Chaouanons, it was officially named the Cumberland River in 1758 by Thomas Walker. Our hope for this website is that we can serve as a guide to the river for you. Most of the area surrounding the river is rural so it will focus mainly on activities available in the Nashville area (or NashVegas, as it is affectionately called by the locals), but if you live near the river and have a suggestion for us we are all ears! The river offers many fun activities for the family like boating, fishing, birdwatching, hiking, and more. 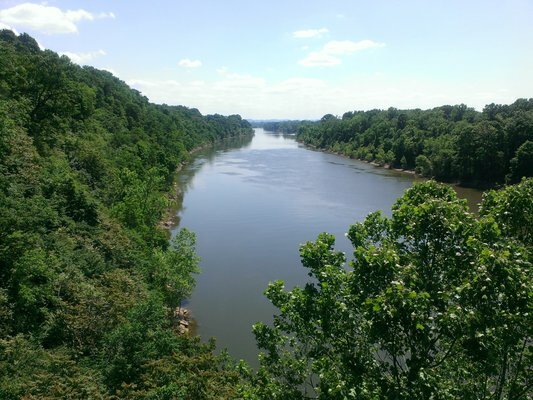 Please consider donating to the Cumberland River Compact, they are a group that works on making sure that the Cumberland River stays environmentally healthy. They work with all parties involved with the care of the river from local, state, and federal government to farmers and neighborhood groups. Their work includes educating the public about watersheds, advising on sustainable building practices, planting trees and rain gardens, and advising local farms on sustainable agriculture. They also run some fun and educational events throughout the year such as the Catfish Rodeo in June and the Dragon Boat Festival in September. Any and all donations are wonderful, $100 will clean 20 linear feet of stream.